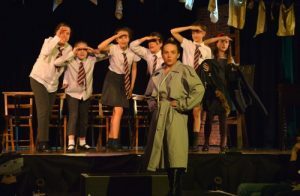 On Friday, pupils from UIII and LIV performed in the wonderful show ‘Where is Love?’ The girls performed a variety of songs from the well-known musicals, Annie, Matilda and Oliver. They worked so hard during the whole rehearsal process, and were dedicated to making it a spectacular show. Every part had some memorable moments and many highlights – from ‘I’d Do Anything’, sung by the Oliver cast, to ‘Little Girls’, sung by the scary Miss Hannigan. How could we forget the chocolate cake scene with Miss Trunchbull, and when Amanda Thripp was thrown by her pigtails! All of the ensemble pieces were performed with elegance and flair, especially the finale song of ‘This is Me’. The girls were a pleasure to direct, and I am so proud of each and every one of them. Huge thanks must also go to Mrs Cheadle for her tremendous hard work in putting the show together, as well as Mr Sykes, Mrs Holman and Miss Connolly for all their help.